In stock -This product will ship today if ordered within the next 6 hours and 45 minutes. 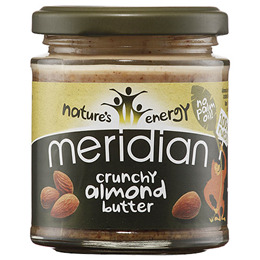 Meridian Crunchy Almond Butter (170g) is made using 100% almonds. Each almond contains around 20% protein and are low in saturated fat. Below are reviews of Meridian Crunchy Almond Butter - 170g by bodykind customers. If you have tried this product we'd love to hear what you think so please leave a review.